With the close of summer, there are lots of things that we start to miss....sleeping in, drive in movies, family reunion trips, and s'mores around the campfire. While planning our Back to School party treats, I saw these fun First Day of School treats from Chrissy's Crafts. We decided that we weren't ready to abandon our S'mores treats for the school year, so we decided to make these Back to School Chalkboard S'mores. I started with a box of Honey Graham crackers, a jar of Marshmallow Creme, a few Hershey Candy Bars, and a little bit of white chocolate wafer bits. To make these, simply snap one of the Graham crackers in half to make two squares. Then spread the marshmallow creme on the top of each of the sides. Break one of the chocolate bars in half and place it upside down (the squares are facing down) on the marshmallow creme. Melt a little bit of the white chocolate wafers in a zip lock back for 30 seconds at 50% power. Be careful to do this because white chocolate burns easily. Once the chocolate is melted, snip of the barest edge of the corner...really, the smaller the better for clean lines. 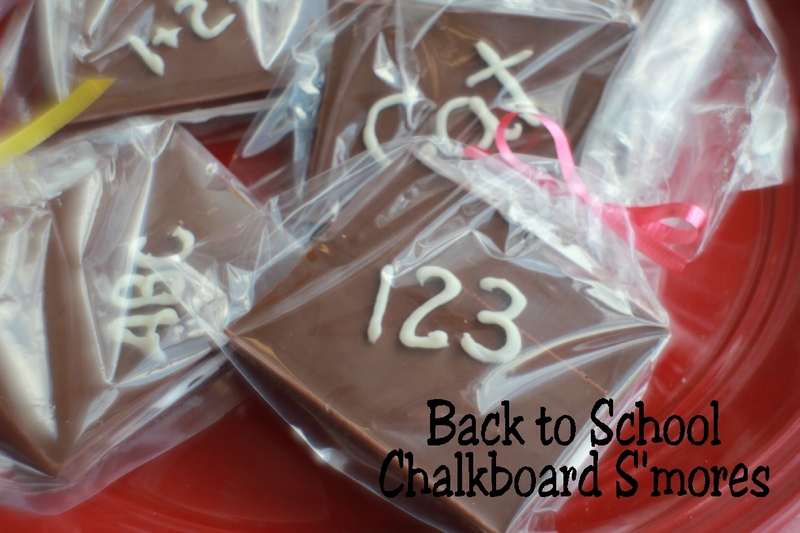 Now use the chocolate "chalk" to write on your S'mores "chalkboard". I finished these Chalkboard S'mores treats by placing them in a 4x6 inch bag and tieing them with red, yellow, and blue ribbon. Now we have a little bit of summer to carry us into the new school year.